Every year, Capsana's Quit to Win! Challenge invites smokers to give up smoking for 6 weeks. Launched in 2000, the Challenge is one of the smoking cessation campaigns that reaches the greatest number of adult smokers in Quebec. Since its first edition, more than 450,000 people have registered alone, with a fellow smoker who also wants to quit, or with a non-smoking sponsor. During the Challenge, participants have free access to the Challenge website, an online personal file, and encouragement and support. To improve their chances of quitting, they can also join the Challenge Facebook community, and sign up to receive motivational e-mails. In addition, all participants are eligible to win some great prizes! Free support is also available from national smoking cessation services, such as the iQuitnow helpline (1 866 527-7383) and regional Quit Smoking Centres. Developed by experts, the Challenge's unique and motivating approach works: on average, 75% of participants successfully meet the challenge of not smoking for six weeks. 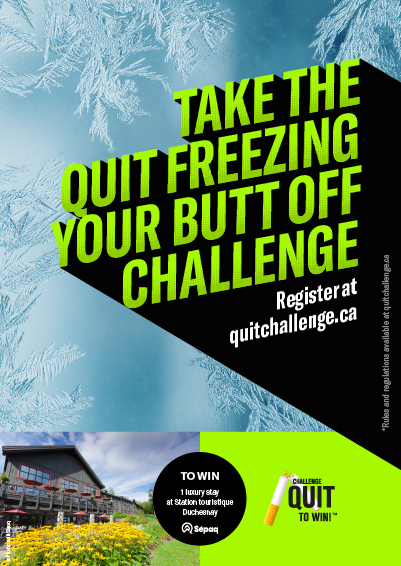 Produced in partnership with the public health network, the Canadian Cancer Society, and several private-sector organizations, the Quit to Win! Challenge is supported by a significant media presence. The Challenge remains relevant in a province where there are still more than 1.3 million smokers, over half of whom want to quit! On average, 3 out of 4 participants successfully meet the challenge of not smoking for 6 weeks! Since the first edition, more than 450,000 people have registered for the Challenge! In 2018, 14,155 participants registered for the Challenge! Contact us today to become a Quit to Win! Challenge partner!